I got the $35 chair from Craigslist. I felt very fortunate to be the first person to contact him because there were numerous others behind me. It's very tattered and torn and it looks very out of place in my home right now but hopefully soon this diamond in the rough will sparkle. Here is a closeup of the carved roses at the top. 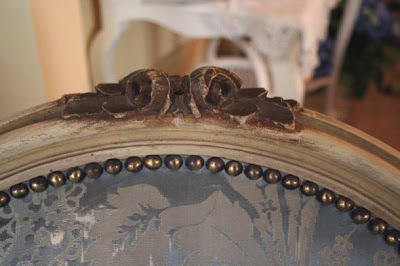 I plan to paint it white (that shouldn't shock anyone) , antique it and then have it reupholstered. It also has carvings in front below the seat. I never thought that picking fabric for a chair could be so hard. I'm so confused on what I want to do. 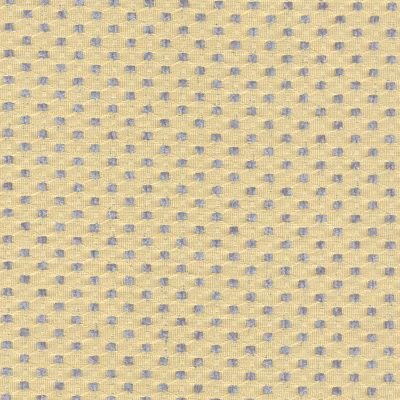 Here are some fabrics I've found online. This one is very similar to what's on there. The original fabric is silk but I don't want to use silk because I don't think it's practical with kids and a dog in the house. Here's another possibility perhaps with a coordinating fabric. 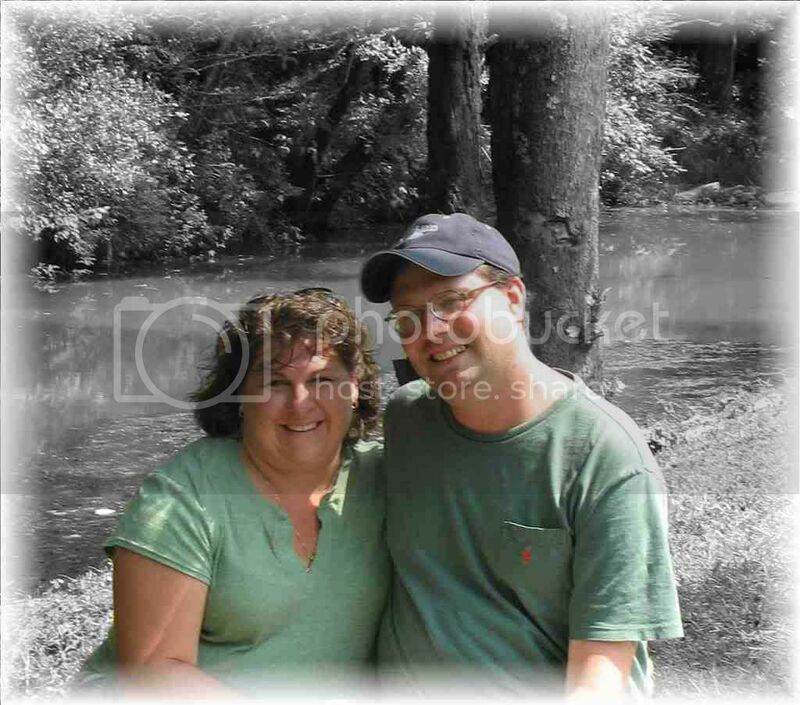 Here's another one that's very similar to the original. This is pretty too but maybe too light. I would actually love to do the whole chair in white linen but I know that's not practical. Here are some chairs I found online that I'm using as inspiration pieces. 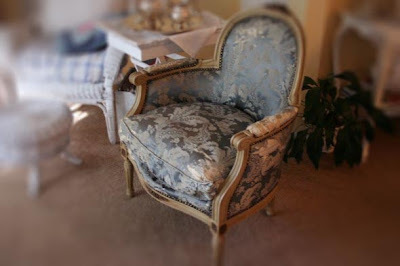 I love the idea of using different fabrics on the chair like this (except in blue's). 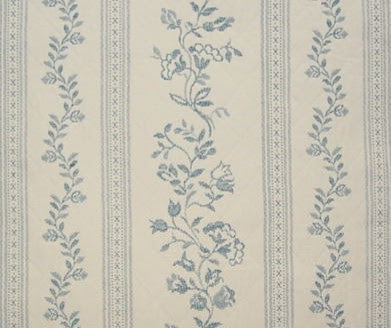 I would love to find a toile like the one below in blue. Isn't this chair gorgeous. I just love French Country! Another lovely one... Below is one in blue and white but I don't really like this...I think it's too busy. I don't know what it is but there is something about it that doesn't seem right to me. 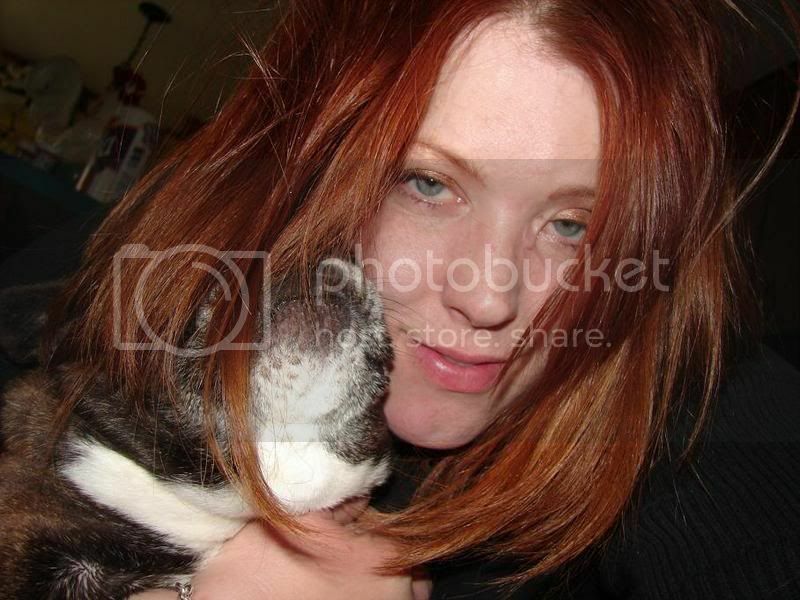 This is my "what not to do" inspiration picture. When I was looking for inspiration chairs online I realized what a great deal I got. Most of these type of chairs were $1,000 to over $2,000. Oh...Guuuurrrrllll....I love that chair...I am so glad you decided to go for it! 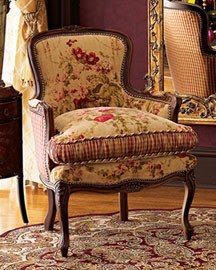 I think your ideas are fabulous...I especially love the 2 chairs with different but coordinating fabrics. I do however love the 2 fabrics you chose that look similar to the original fabric...I am sure whatever you decide...it will be awesome and you will love it. 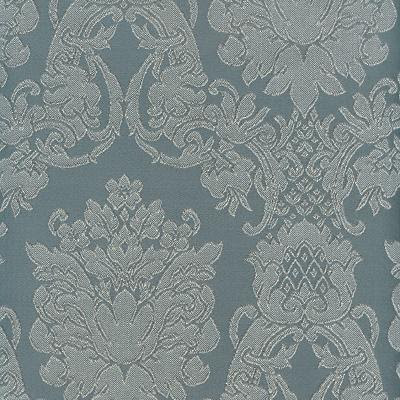 Have you checked out www.fabric.com they have tons of toille...go to the sidebar...look under home decor and click on to toille...quite a selection. Not sure if their prices are better than local markets...but they do have a wide selection. They will also send you a nice size sample piece, I think the price is $1.00 and well worth it b/c if you need to find something coordinating outside of their store...it is easier with a decent size swatch. Also, I ordered some toille from them once, sent in for the sample...but when I ordered the fabric it was not from the same bolt as the sample so it didn't go with the other fabrics I had chosen to match up with it...they GLADLY took the fabric back...and gave me my money back...no questions asked...but they seemed very concerned about my satisfaction. You really were very lucky - that's a fabulous deal and beautiful chair! I like the idea of using two different fabrics. Can't wait to see it all done! Oh, that is just a terrific deal! It's such a beautiful chair, and I'm sure whatever you pick will be fabulous. 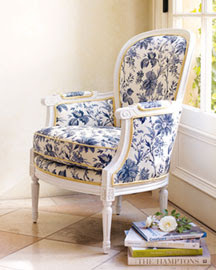 I love that blue/white floral stripe, too, but you just know that it would be the dog's favorite chair! Can't wait to see the finished chair! Wow that chair is beautiful. Can't wait to see when you have worked your magic on it. That chair is really going to be a show stopper when you get done with. I love mixing fabrics.... what ever you decide to do it will be spectacular....I like mixing the formal with homey... chenille or a quilt. Definately one of the ones that looks like the original. Those are meant to be with that chair!!! LOVE that chair, you are very lucky for getting it at that price, what a bargain!! I actually really love the original fabric so the first pic of the new fabric is the one I like best too. I have a thing for chairs I must say but the ones I had to renovate I ended up selling at my shop as I just never got around to doing it! 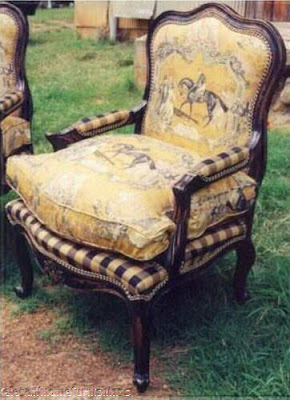 If you refinish it first...at least when you drape sample fabrics over the area of the chair to be covered.. ..you should get a good idea of what they will look like against the "antiqued white" ... make sure you use a large enough sample piece to get the full effect of the pattern. I wonder... if you think the last chair is too busy I am not sure toile is the answer. What a great find that chair is! Look forward to seeing what you decide. I whole-heartedly agree with Angela--a professional upholsterer will help you select appropriate fabrics and give you lots of ideas regarding mixing patterns, trims, piping etc. It's their job to know what works and what doesn't. I just had a very good experience with Calico Corners this past summer. If you have one near you, I would highly recommend them. They aren't cheap but I found the staff to be extremely pleasant and so helpful. Wherever you go, be sure to take the picture of your chair along, as well as pictures of your home. That helps them see what they're working with. Finally, the internet can be a great source for ideas but personally, I can't make a decision from the swatches the online companies send you. I want to see the largest piece possible, to view as much of the pattern as I can and its true colors. I also need to feel the texture and weight of the fabric. Most places will let you take a big piece home (or sometimes even a whole bolt if the fabric is in stock) so you can actually see how it looks in your home. I'm so glad you got the chair! It's a prize and I'm not surprised there were several calls for it. I know you'll do something wonderful with it. The fabric reminds me so much of something my parents had. I told you it was a great chair Cindy. 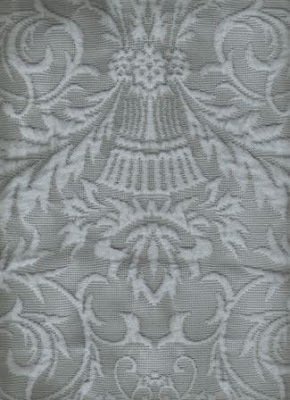 I love toile, but any fabric you choose will be great! Can't wait to see the finished chair. You really got a good deal. And I'm looking forward to seeing the final product! Stop by my blog for a chance at my giveaway! What a bargain you got you lucky lucky Gal...actually I don't believe in luck but it seemed fitting...it was great that you were so quick to act!! !It sure does have a lot of potential and I can't wait to see the finished product! Oh my gosh, you got a smokin deal Cindy! I love the cushion on the arms soooo much... so charming! I love the idea of using two fabrics too. You will know when you see the right fabric! Can't wait to see the chair in all it's glory! I love this chair! I like your idea of combining fabrics. I think combing fabrics 3 & 4 would be awesome. You could use fabric 4 for the riser on the cushion maybe and 3 for the rest of the chair. I like stripes and toille together too! Have fun! Great chair, Cindy! I know you are happy you snapped it up. It will be gorgeous when you get it reupholstered. Too bad the original fabric is too tattered, as that would go so well in your home. I think one similar to the original would look great too! Cindy, you gotthe buy of the century on that lovely chair! I can't wait to see it painted and recovered! What a beautiful chair and a fabulous price to go with it! You have a lot of work ahead of you , but oh how wonderful it will be to see the finished product! I do think the blues will be perfect. Good luck with your project. Your chair is just lovely. Guess it'll look very nice once you've finished your work on it. I hope you're having a wonderful Wednesday. Great chair and can't wait to see the finished product. I too like the idea of mixing some fabrics but have no idea how you will ever choose! Maybe buy a couple larger pieces of ones you are leaning toward and drape them over the chair for a few days to get a better feel? LOVE that chair!! You always find such good things on craigslist! I always look but I never find good stuff on there! lol! Can't wait to see what you do with it! OMG!! I just fainted! That chair is spectacular and you got it at such a steal! WOOO HOOO for Craigslist! :) I have been keeping my eyes peeled for something like that to come my way. Love the chair, good luck on rennovating it. The other examples you're drawing on for inspiration are also wonderful. I trust you'll post a picture of the finished project, so I'll check back to see how it turned out. That chairs is ultra gorgeous!! I love that classic french fabric..yumm! By the way, please visit my blog..I'm having a Holiday Decorating Contest on my website! Gorgeous! And even better that you got it for such a great price. For what it's worth - if you want white linen then that's what you should do. If your puppy is allowed to get on it, put a piece of fabric that's similar size and color, but that can be washed. I think white would look great. Find is right! $35! Amazing! Cream white sounds fabulous and looking at the wood roses they would look beautiful as well if you leafed them in a tarnished silver gold. I think the roses would pop out more. The original fabric is just so....Funny how every one would have a different take on this decorating venture. That’s what fun is when one finds a treasure and makes it their own. Does he have any more haha......Luv, luv it! Gorgeous find! I just had to comment. I just stumbled onto this site because I set a Google Alert for "Nantucket!" Haha. And somebody wrote about Nantucket souvenir plates and here I am! I love this site and I love seeing your very definitive chair story. 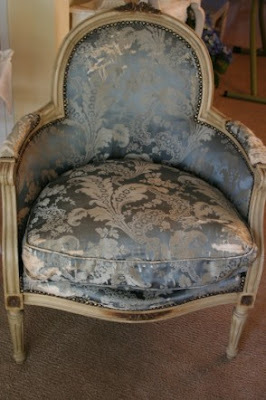 We do upholstering for a living and have covered so many antique chairs and this one is SO pretty. You got a whale of a deal. People so often do not realize what they are throwing away! It costs a lot to upholster things, so I wish you much luck with your project. I am sure you will have a "romantic" home with this chair inside it! I wrote yesterday and this morning asked the upholster about his opinion, seeing your chair online. It has a cushion, it appears. You have to have a sewing machine that will take thicker fabric. If you use thin fabric, like pillow or dress material, that does not have a backing, it won't hold up (unless nobody uses it). There's do-it-yourself finishes (antique kits) at the hardware store that are easy to follow. Putting the nails close together is tricky - be careful you don't hit the wood and damage it. You'll have to piece the inside and outside back, it's a curve and you have to piece it and that means you get a curved needle and you blindstitch w/ the right nylon thread, can you blindstitch? Do the springs need rebuilt? Do you have twine? Is the stuff in the cushion plump and good enuf or do you need new high density foam with a Dacron wrap to make it nice and plump? It looks like you have a spring unit there. Sometimes those springs get busted with age. It doesn't appear to be that difficult of a chair, it's not like a tufted or fluted chair. The only thing is, if you're unskilled you're very awkward and would probably do a terrible job without expert hands-on help. Good luck because people who try this stuff on their own learn respect for what the upholster really does. Anybody can cover a few dining room chair seats over top of the old fabric. But when they get into difficult things, they do not know what they are doing. The upholster spends decades learning his craft. The upholsterer here began when he was 8 yrs. old and he is 71 now! I've seen similar chairs at the antique store and thought of buying but was afraid of the upholstery being mildewed, etc. I guess it wouldn't be all that hard to do the upholstery myself if I made a pattern from each piece as I took it off but I wouldn't want to bring the chair inside until it was finished. Good luck. I admire all the things you do with the pieces you find. Cindy you would be surprised how very very durable silk is!! ALL my furniture is covered in silk with kids and a cat!! NEVER had an issue. You can scotchguard it and I have done this for years! Mine is a maize, gold color. I will do a special post for you on my fabric so you can see this weekend. I also have several contacts if you want upholstery at designers cost. All over the West Coast. email me and I'll hook you up! PS It's a STUNNING Chair! Let me know when I can take it off your hands LOL!